Typically there is no reason to change the MAC address of a computer's network adapter. Reasons may be because of technical problems with the current MAC address, hard coded MAC address support of services or devices, or to change the MAC address to make identification difficult. Previously reviewed software MAC Makeup had a lot to offer, and was back then considered to be one of the best applications for the purpose. The program has not been updated in five years though, and while it might still work it is a good idea to have a more recent alternative at hand. Windows 7 MAC Address Changer is that program. While it is currently offered as a beta version, its software developer has promised to release the final version of the application tomorrow. Despite its name, it is not only compatible with the Windows 7 operating system, but also with Windows XP and Windows Vista. The program displays a list of all connected network interface devices under interface name. 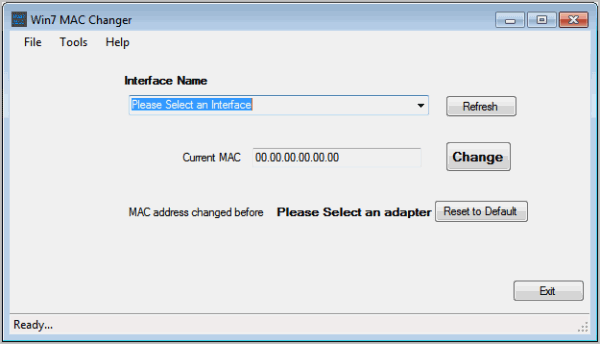 Here it is possible to select a device to see its current MAC address in the program interface. A click on Change next to the current MAC address listing opens a new window with options to change the address right away. It is necessary to select the operating system first, and to add a new MAC address manually or by clicking on the Random button. Random will generate a new MAC address every time the button is pressed. A click on apply sets the new MAC address. There is an option in the main program interface to reset the MAC address to its default value. It is furthermore possible to display and save a log file, handy to save the information before making the changes. The program seems to require the Microsoft .NET Framework, but no information are provided on the developer website about the required version. 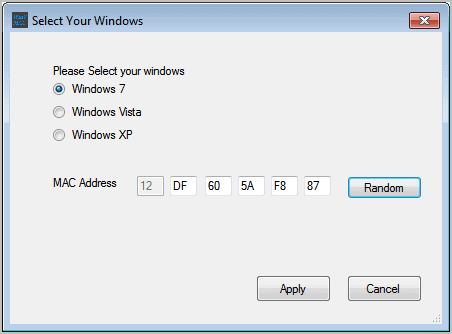 Windows 7 MAC Address Changer can be downloaded from the developer website over at Blogspot. I’m not a native speaker, but doesn’t has it to be “difficult? This is difficult, that’s even more difficult and that’s most difficult. You might be right, I correct it. I’ve been using TMAC at http://www.technitium.com/ which works fine; however, I forgot why I absolutely needed to change my MAC address. It had something to do with covert operations which would provide me the same IP as the MAC that had been used from another machine so that my machine “appeared” to be the original machine. Whatever–it did work. The subject and verb of the sentence would then be “Reason may be.” The words which follow form the infinitive phrase which is being used as a noun–a direct object. Finally, we arrive at the understanding that for this particular sentence structure “difficult” is being used as an adjective and would require the dropping the of “ly” which is typically a marker of an adverb. The sentence could be re-written: Difficult identification of a computer is achieved through changing the MAC address. Such a rewrite makes the unbearable strain of correct language use much easier. SV = Identification is achieved. What type of “identification”? Difficult. Adjective. Thanks for the lesson, I appreciate this. This program is crap, Martin if I was in your boots I’ll tell them and remove positive notes.